48ft long patio string lights with 15 suspended sockets, 3ft/bulb, 18 x 0.9 watt LED S14 bulbs included, 3 spare bulbs. 2-PACK DIMMABLE STRING LIGHTS -- Work with SUNTHIN dimmer (Search: B07F623QT5) 96ft in total. 2 x 48ft long LED patio string lights with 15 suspended sockets, 3ft/bulb, 18 x S14 LED bulbs included, 3 spare bulbs. 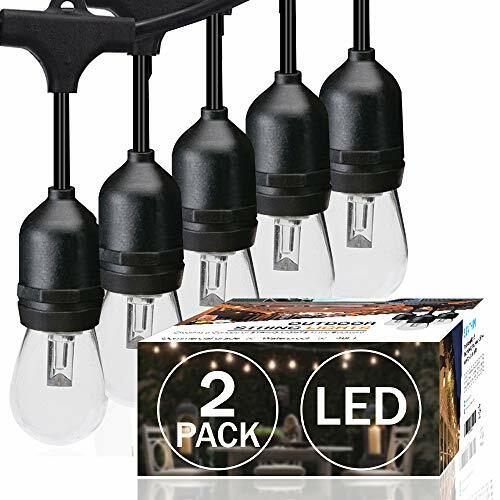 EXTRA CHANGEABLE LED BULBS -- Our string of lights includes 18 LED shatterproof bulbs (Plastic material) with 15 standard E26 sockets. Sockets will fit any bulb with compatible base so you have the option of switching up your style.